Dry-Treat Eff-Erayza™ is a new technology acid cleaner for removing efflorescence, rust stains, limescale, grout haze, mortar mess and fireplace soot. Dry-Treat HANAFINN Rejuvenata ACTIVE™ is a powerful, natural active enzyme cleaner concentrate for both heavy duty and light duty (regular) cleaning of all natural stones, tile, grout, brick and other hard surfaces. Dry-Treat HANAFINN Rejuvenata Spray is a gentle daily cleaner for natural and engineered stone countertops. Dry-Treat Oxy-Klenza™ is an odorless, powerful triple action, oxygen, alkaline and detergent boosted heavy duty cleaner for removal of general grime and stains caused by oil / grease, mold, leaf marks, food and beverages. Dry-Treat Stain-Repella™ is a penetrating, invisible and breathable water-based sealer which protects porous surfaces against stains to keep surfaces looking great. Dry-Treat STAIN-PROOF PLUS™ is an impregnating, invisible and breathable sealer that protects natural stone countertops from damage caused by water, salts and oil-based stains. Dry-Treat STAIN-PROOF Original™ is an impregnating, invisible and breathable sealer that provides premium long term protection for natural stone, tiles, pavers, concrete, brick and grout. 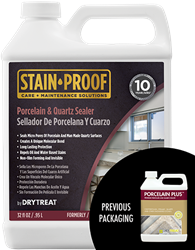 Dry-Treat PORCELAIN PLUS™ is a premium, impregnating sealer specifically designed for porcelain and quartz surfaces. Dry-Treat INTENSIFIA™ is a color enhancer & sealer suitable for a wide variety of applications, including floors, walls, cladding, facades, countertops, patios, driveways, paths, garages, kitchens and entertaining areas. Dry-Treat META CRÈME™ is the next generation of sealing technology, the ultimate breathable impregnating sealer for protecting natural stone, tiles, masonry, pavers, concrete and grout. Dry-Treat 40SK™ is an impregnating, invisible and breathable sealer that protects porous tile, natural stone, brick, terracotta, paving and grout from damage caused by water and salts, plus helps to consolidate friable surfaces.